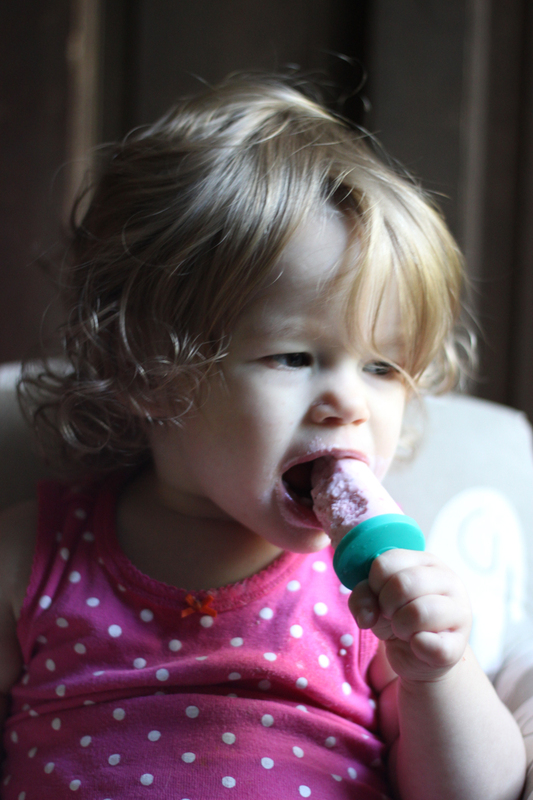 Honest mom moment here: Last weekend I let my daughter have a popsicle for breakfast. Actually she had two - because after she devoured the first one I couldn't help but answer her plea for "more, pease". These Strawberry Oatmeal Yogurt Pops were designed from breakfast anyway. Our twenty-month year old daughter has spent the summer filling her mouth with teeth - seriously molars and canine teeth back-to-back-to-back. Hence why I've covered a few frozen toddler treats here in the last month. We've been enjoying lots of ice pops, frozen yogurt, and we've recently introduced her to the joy of smoothies. 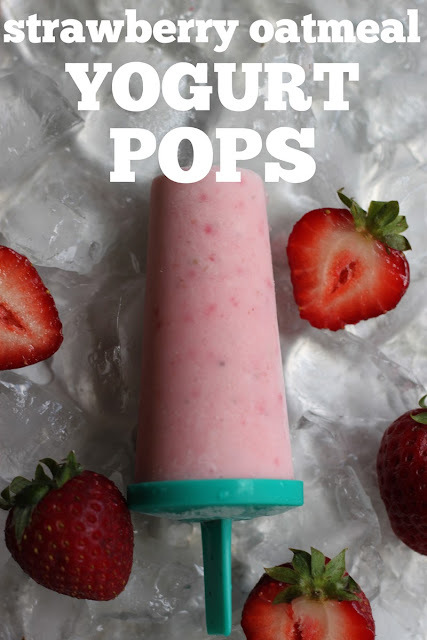 The idea for these pops actually came from a small habit I have of freezing leftover smoothie in ice cube trays to use in later smoothies. Really, I just skipped the smoothie part. My friend Patty introduced me to the idea of throwing a few tablespoons of oatmeal into my smoothies years ago - it had tons of body as well as fiber and flavor. 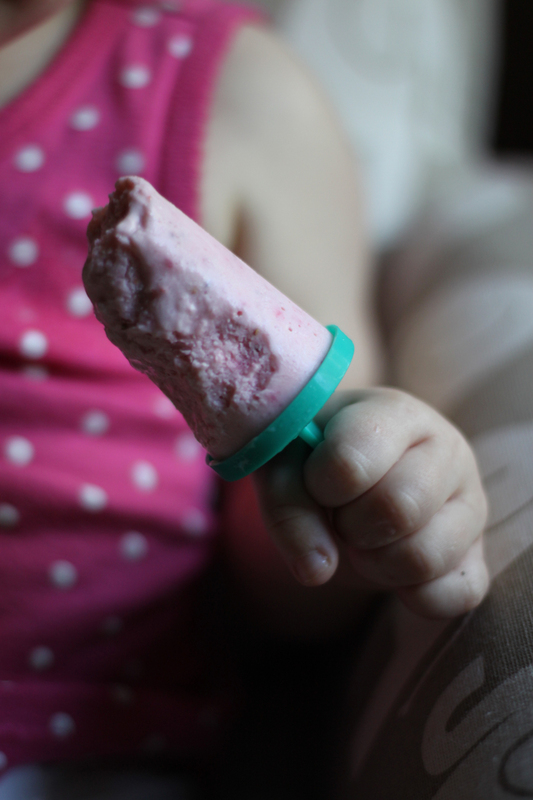 I bet you could take any old smoothie and freeze it in popsicle molds to the same effect. Combine yogurt, banana, strawberries, oatmeal, maple syrup, and kosher salt in a blender. Puree until smooth, pour into molds and freeze until solid 4 to 6 hours. Gurl now I love this idea.. my son loves strawberries so he would definitely be all over these. Silly ? But what kind of oatmeal do you recommend? Just started following your blog-thank you for sharing!!! Hey Rebecca - we typically use old-fashioned rolled oats from Bob's red Mill because thats what we keep in the house, but because the oats aren't being cooked feel free to use quick-cooking oats of any brand. I'd stay clear of instant oats for these though.